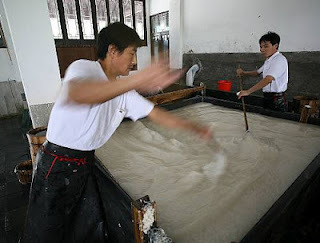 The unique water quality and mild climate of Jing Countyin Anhui Provincein eastern Chinaare two of the key ingredients in the craft of making Xuan paper that thrives there. Handmade from the tough bark of the Tara Wing-Celtis or Blue Sandalwood tree and rice straw, Xuan paper is known for its strong, smooth surface, its ability to absorb water and moisten ink, and fold repeatedly without breaking. It has been widely used in calligraphy, painting and book printing. The traditional process passed down orally over generations and still followed today proceeds strictly by hand through more than a hundred steps such as steeping, washing, fermenting, bleaching, pulping, sunning and cutting – all of which lasts more than two years. The production of the ‘Paper of Ages’ or ‘King of Papers’ is a major part of the economy in Jing County, where the industry directly or indirectly employs one in nine locals and the craft is taught in local schools. True mastery of the entire complicated process is won only by a lifetime of dedicated work. Xuan paper has become synonymous with the region, where a score of artisans still keep the craft alive.